Here we are at release number 3.2. It's now more than seven years since I started coding SketchBlock. The first release being on the 30th January 2012, coding starting in the autumn of 2011, and I am now proud to announce the first release of SketchBlock Professional Edition. Now at over 100,000 lines of code this is major step forward for SketchBlock, introducing new features and significantly enhancing existing ones. See the Changelog for a complete list of changes and read on for an overview. SketchBlock is a powerful digital painting package for AmigaOS 4.1, offering smooth, responsive tools to create images in High Dynamic Range colour. Version 2.6 remains available from Download From OS4Depot and may be though of as a basic demo, though the feature set has moved on way past this older version. The Version 3 series to be known as 'SketchBlock Professional Edition' will be available to purchase from the AmiStore for £15.00 plus VAT with a discount for registered users of 'SketchBlock Lite'. 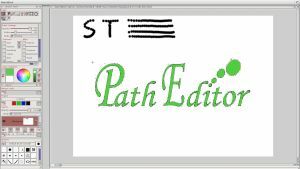 Extensions to the path editor. Individual polygons can now be moved, copied and scaled. When setting up a project you can now choose between High Dynamic Range colour and standard 32 bit colour. The former allows the smoothest colour transitions, whilst the latter make better usage of system memory for those projects that don't need the full HDR treatment. HDR projects are slightly faster to work with as plugins and filters work in floating point HDR internally. With todays modern image formats and sizes you can quickly run short of memory, especially when working in HDR. SketchBlock offers two ways to page the internal buffers allowing much larger projects to be loaded. Extended Memory Paging: Since AmigaOS 4.1 FE Extended Memory is available to allow applications to use memory from beyond the 2 Gb address space limit. SketchBlock can use this for fast paging. This is available on any AmigaOne machine with more than 2 Gb of memory. (CAVEAT: At AmigaOS 4.1 FE Update 1 on the X1000 the cfeide.device must be disabled for ExtMem to work correctly, this should hopefully be fixed in a later version of the OS). Disk Based Paging: On any AmigaOS 4 system disk based paging is available. Tiles of buffer memory are paged out to disk on a Least Recently Used basis allowing almost arbitrarily large projects to be created. Naturally this is'nt as fast as ExtMem paging but can be useful to load and scale down larger images for further work. The paint tool has been extended to add many new features, as well as the previous pressure sensitive, blend modes, jitter and progressive modes, the updated tool adds modulation over the brush stroke, smooth stroke, constraining to straight lines, and integrates with the new colour picker tool. The colour picker tool now supports picking from the current layer or the merged project value, picking the alpha value and sample averaging over a given radius, useful when picking colours from noisier images. The selection tools remain basically the same but add the option to convert the alpha channel into a selection mask and vice verca. SketchBlock Pro adds some new dedicated and optimised convolution based filters. Unsharp Mask: Another classic image process filter. Bilateral Filter: This one is a bit special, performing convolution in both the space and frequency domains, it allows to reduce noise in an image whilst retaining the contrast of edges. With extreme settings it might render a photograph in almost cartoon like way, or more subtly tighten that noisy photo where the light was bit low. New plugins allow the import of a wider range of image formats with much greater control, falling back to datatypes for import of currently unsupported images. Info: Loads direct mapped image data from Amiga Icons. Open JPEG/ JPEG 2000: Supports saving in 8,12 or 16 bits depth with alpha channel. PNG: Portable Network Graphics format with alpha support. ILBM: Supports saving with or without alpha, useful for exporting to applications like Wordworth that don't understand ILBM32 but do load ILBM 24 bits. Info: Save project into an icon. Project must have 1 or 2 layers of equal size less than 256 square. The range od scripts to found in the REXX drawer and accessible from the menus has been increased. Most recent addition is the Add Glow. Combined with the above INFO importers and exporters SketchBlock is now your favourite icon editor. New custom gadgets allow for easier window resizing when large numbers of brushes are loaded. You can setup themes for your SketchBlock GUI, to enable you to use the gadget image set of your choice. Two themes are provided as standard the AISSTheme by 'Mason' and the KSTheme from Kevin Saunders. SketchBlock may be start from either the shell or from Workbench SketchBlock creates an assign SketchPath: which allows ARexx etc to find scripts, and default scripts to save to the correct directory. The assign is removed after the program exits. NB: PROGDIR: cannot be used for this as this only applies to the SketchBlock executable. ARExx, python, perl et al have their own 'PROGDIR:' Some debug info may be printed to the console, but usually only in the case of an error. SketchBlock makes use of many support scripts written in both ARexx and python. These scripts use ProAction for a GUI. Some make us of PIL (The Python Imaging Library). To get the best out of SketchBlock please install the latest versions of these utilities. The GUI is currently divided into 3 windows, the default layout has one large window containing the Sketch, where sketching and other editing is done, and two other windows, Tools on the left and Layers on the right. These windows can be hidden or revealed at anytime by pressing the TAB key. This is where the main sketching action takes place, it should be fairly intuitive, simply click with the mouse and drag to paint. Less obvious will that you can pick a colour from the current pixel by pressing CTRL at the same time as you left click with the mouse (or stylus if you have a graphics tablet). The window title displays useful info about the project, such as project name, modification status, filename etc. Press CTRL whilst left clicking with the mouse or graphics tablet stylus. The zoom gadget is at the bottom left of the Sketch Window, enter the desired zoom level in percent. The best graphical performance is obtained for multiples of 2. ie. 25% 50% 100% 200% 400% etc but any zoom percentage may be specified. As well as the various menu shortcuts additional shortcuts can be defined in the prefs.xml file. These are intended to be user definable but a useful set of defaults are defined. Similarly to menus keyboard shortcuts can trigger commands, ARexx scripts or python scripts, indeed scripts written in any language. TAB - Toggles Tools windows. P - Set current tool to "Paint". E - Set current tool to "Erase". Please have a look at the prefs file and the scripts it calls to inspire your own customisations. This window will remain as simple as possible so as to give the largest sketching space. However, a popup with Zoom presets wouldn't go amiss! All windows share the same set of menus, these are defined via an xml preferences file, and can be user customised by editing that file. The following are the defaults supplied, you should customise them to your needs. "Print" the current project to a file as postcript. The GUI will offer various formats, postscript, eps, and pdf. Copies the currently active layer into the system clipboard as an IFF image. Pastes the contents of the system clipboard into the active project as a new layer. Only works if the clipboard has an image in it! Modify the selection with the alpha channel of the current layer. Actions are the same as those available in the tools. Zoom project so as to fit the whole project into the window. Zoom project so that the whole window is filled. If the projects aspect ratio is not the same as the window, then parts of it will be clipped (scrollable of course). Save the current zoom level and scroll bar offsets. Restores the zoom to the state saved with the above command. This is very useful if you wish to zoom in on part of the image, then zoom out to see the whole, then quickly zoom back to do some more close work. Image level commands and actions. Import an image via the datatypes system and add it to the current project. Path manipulation and loading saving etc. Brings up a ProAction based requester to enable you to create a preset from the current tools settings. You may choose which settings you want restored when the preset is selected. A list of currently available presets. Presets are stored as mini ARexx scripts that set the required state. Create a load / save palettes. Creates a new empty palette and adds it to the application palette list as the active palette. Select and remove input wedges and other miscellaneous scripts. These are script based plugins that add significant functionality to SketchBlock. Draw rectangular boxes using the current brush and paint tool settings. An advanced plugin that allows you to draw bezier curves using the current brush. CTRL click to set the centre then drag to set the size of the circle. Press SPACE to stroke with current brush or SHIFT SPACE to fill with the current colour. Under the bonnet this script uses a path to simulate a circle, this is not 100% accurate but for most uses you'll hardly detect the difference. Another advance plugin, this time with a ProAction GUI. It allows you to draw boxes, which may be filled, the outlined may be stroked with the current brush, the corners maybe rounded. etc etc. The location of the box id shown by dotted lines in the sketch window. It can be positioned via the GUI or by dragging the edges with the mouse. When working in the sketchwindow press "D" to draw the box or "C" to cancel. Or press the corresponding gadgets in the GUI window. Copies a rectangle in the active layer into a new layer. Just drag the mouse to select the area. This is a one of wedge, it removes itself after a completed copy. Removes the currently active input wedge. An advance script that combines the above two actions. 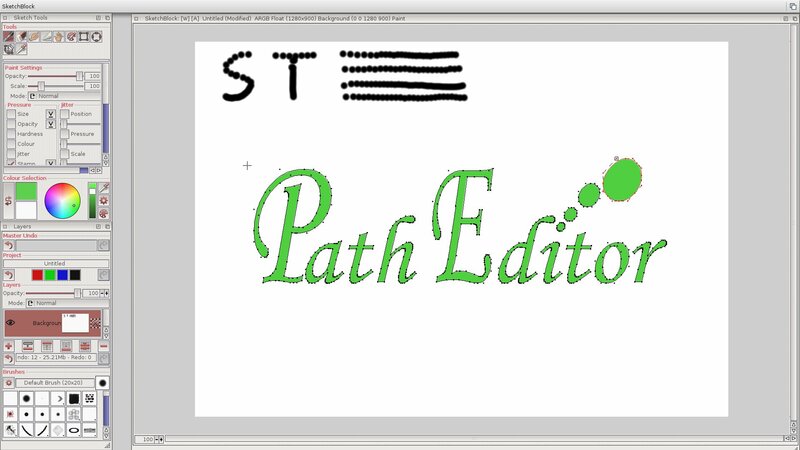 The script itself performs extensive calculations using the READPIXELS and WRITEPIXELS functions to access layer data. Can create a cartoon like effect depending on the image, but will be slow on larger images. Be patient!